It is sometimes obvious, when we are out on the water, to see how some boaters either have little knowledge of their obligations under COLREG’s or are mis-interpreting them. The most obvious mis-interpretation is regarding ‘Right of way’! To hear two boaters arguing about a near miss situation can be quite informative. When one party shouts “I have right of way” you just have to be a little concerned. Have they read the International Regulations for Preventing Collisions at Sea (COLREG’s) and if so did they only read the bits that, they think, will give them rights over other marine traffic! The waters don’t have to be congested for accidents to happen but congested waterways increase the risk of accidents as leisure boaters and commercial vessels vie for the same space. 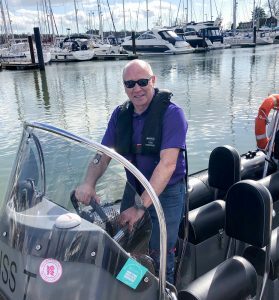 A busy sea port such as Southampton, handling a huge amount of both commercial and leisure traffic, has local regulations that need to be understood by all boaters, commercial, sail, power etc. Ignorance of these local regulations is rarely accepted as a defence should a Marine Accident Investigation Board investigation be required. All too often mis-interpretation of COLREG’s by one or both parties can result in situations developing that can easily end in tragedy. We never stop learning no matter how much experience we have, or think we have. Jon Mendez has previously posted about IRPCS with some useful graphics that illustrate some of the basic rues. It is not the intent of this site to provide a definitive interpretation of each rule as it would take a web site in its own right. However, we have shown a range of situations relative to the use of small craft operation. Pass “Port to Port” a vessel operating in a river or buoyed channel should with oncoming traffic keep to the starboard (right hand) side. When two vessels are approaching one another head on, they should alter course to starboard (right) and pass as if they were operating in a river or channel. The alteration of course should be early, clear and substantial so the other vessel is fully aware of the action being taken. A boat coming from your starboard (right) is the “Stand On” vessel and you should make a clear move to starboard and pass behind the other boat. Where a vessel is coming from your port (left) side then it is the “Give Way” vessel and should make the appropriate move. In the event that the give way vessel does not alter course then you should either slow down, stop or turn to starboard to avoid the collision. DO NOT turn to port! Where a powerboat is approaching a sailing boat – irrespective of which side the yacht is – then the powerboat must act as the “Give Way” vessel and give the sailing boat clear passage. It is considered good seamanship for the powerboat to keep clear of the sailing boat so as to avoid the effects of its wash on the yacht, particularly in light winds. We are alway available to help you brush up on you theory and practical boat handling skills.